There are various utilities that can help you to check and maintain the latest drivers for your Windows PC systems so that you can always get the best performance out of it. Some of them are like Free Download Control, Ketarin or RadarSync but in case you are planning to try out something different, DriverMax could be one of your good alternatives. During the installation, DriverMax will start indexing all your drivers but don’t worry as there will be no configuration in your Windows will be altered. The utility may looks unresponsive for 3 to 5 minutes but this is absolutely normal so just be patient to wait for it completion. Basically there are three main functions that you can explore with this utility. 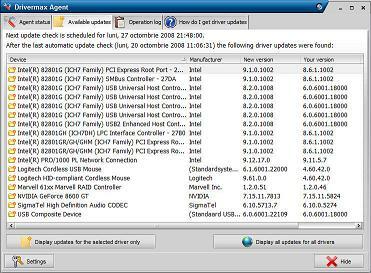 The first one is the Driver downloads and info that allows users to check online for driver updates, start the DriverMax agent, identify unknown hardware as well as disclosed detailed hardware information. DriverMax agent allows users to check for latest drivers automatically based on database and information collected from community. Besides, users can do driver backup and restore by just following the wizard setup and at any time in case there is some problem happened, users can easily rollback the driver by putting it into restore point to recover from the problem. Last but not least, users can search for the popular hardware pieces such as the best hardware for Windows Vista, get the most popular video cards and processors with manufacturers’ names as well as getting some detailed performance comparison for various laptops and etc. DriverMax is compatible to work with Windows XP, Vista and even Windows 7 in both 32-bit and 64-bit version and you can rely on it to get latest updates for your system drivers for optimum PC performance all the time.